SMOKEmUP.com :: View topic - Ever seen this before? Posted: Sat Mar 05, 2011 9:48 pm Post subject: Ever seen this before? My son blew a head gasket in his 86 Buick Grand National. For anyone that doesn't know about the GN's. They are 3.8 V6 Turbocharged. He was running a bunch of boost. When he took it apart 5 of the 6 pistons had all the ring end gaps facing 12 o'clock. I've never seen that before. Wondering if any of you have or might have a reason for it. During assembly the end gaps were set to spec and installed staggered like they are supposed to be. from what ive been told by some successful engine builders, it doesnt make much difference where you put the gaps because they will move anyway. i still stagger mine because it gives me that warm fuzzy feeling . I'm aware of the rings moving around in the bore, I've just never seen all of the end gaps aligned before. All at 12 o'clock and in 5 of the 6 bores. We've always staggered rings according to which bank they go in. Don't know if its aggravated by turbo boost. He was running over 20 pounds, maybe in the 23 pounds area. The engine has very few miles on it since he put it together. A head gasket blew even though both surfaces were cut, he used the gaskets recommended by one of the turbo guru's and we always recheck head torque after breaking the engine in. There was no detonation. I didn't do the machine work myself but we did supply the block plate. We purchased the rings from them. I have the utmost of confidence in my machinist. Paul P. also uses Paul Rinaldi. Anything is possible but I doubt he would have honed the block incorrectly. We won't miss any sleep over it. I just thought it was unique enough to ask if anyone else has experienced it. A couple revolutions would stagger if it was X honed? I wonder now how they would end up??? After racing a single ring 2 stoke for 4 years the leak down was never taken with a grain of salt. The compression test was. That's weird. Ping 86GN, he might have some ideas on what's going on with it. I thought of him because of his background with serious GN's but I haven't seen him on this site in a long time. Haven't seen him up the track either. Have you had any contact with him? Having locals like you, 86GN & Paul P. is great. I've taken apart hundreds of engines and never seen all the rings lined up like this. None of them are broken. The fit in the ring lands looks great. Cylinder walls & pistons are fine, just that the rings in 5 of the 6 cylinder were aligned. I forgot to ask him if that included the oil rings. Paul Rinaldi has never seen it and how many serious engines has he put together. I mentioned you to Chad Golen the other day. He said to say hi. So Hi!! I'm figuring this problem might be a product of turbocharging. My son, Michael, says he might have run as much as 24 pounds boost. The engine has maybe 1000 miles on it. He was taking it apart for the second time because of a blown head gasket. He Installed a supposed indestructible gasket set but they blew out. The mating surfaces checked out fine. The engine has never detonated. He has a methanol injection kit on it. The reason he took the short block apart was because he's contemplating going with forged pistons. Blew me away to see that the original GN engine had cast pistons. I had a turbo 4 cylinder Plymouth Acclaim years ago and I'm pretty sure that had forged pistons so I figured everything turbocharged would too. I was also surprised as to how heavy the stock piston is. My son is contemplating building a 400 small block with twin turbos for another GN he has. He bought this one as a basket case. Actually he bought two and is making one. Has over 200,000 miles on it so it's not like he'd be bastardizing a collectors item. Please let me know if you get up the track with either Camaro. I'm cutting back on how much I race this season. I plan to run the Nostalgia Events and a few others but I'm not going to run the points program. What I like best is to run Wednesday afternoons. The toughest thing for an old test & tuner like me is to backpeddle to continue into the next round like you have to do running points. I always want to go faster. The two strokes that i've seen have a pin to keep the ring located where it is installed. Where is 86 GN good question? 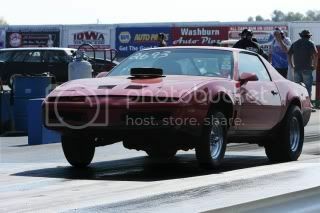 Jeep I would like to meet up with you on one of these track days with SMokE if possible. I do trust Paul Rinaldi as a very good source for engine work. He just does stuff the way I would do it if I was in the business. Twin turbos i did consider but the car would have to go through a complete gutting front to back and the $$ is just not there now. That kind of power is nice but it would tear everything in the car up if it hooked except for the drive shaft. Oddly enough I might have my 2001 Ford Focus ZX3 5 speed that I have been modding up at the track before the Chevelle. I know it is a Ford, front wheel drive ect, but it did keep up with a 2011 Porsche Cayenne S the other day. Just my daily driver. Curiosity and my buddy with a WRX is itching to race me. He does have a turbo but I'm hoping power to weight is the key. By then I'll have a set of Crower stage II cams in it. Other mods to this 2.0L Zetec engine are ported head, Cosworth header, ORP w/2.5" exhaust, 65mmTB w/port matched intake, SVT MAF tube, Airbox w/snorkel, K&N filter, MSD coil, 8.5 superconductor wires, Autolite XP iridium plugs and a tune of course. All the suspension has been replaced with a Ford racing kit struts, springs and rear sway bar with Prothane bushings everywhere. It is off topic completely but is fun to drive. Hey one benifit is that I have an Innovative MTX-L WB gauge that I will put in the Chevelle to tune it. Jeep... I haven't talk to 86GN in awhile. http://anderson-performance.com/ <-- I think is his site ?? ?